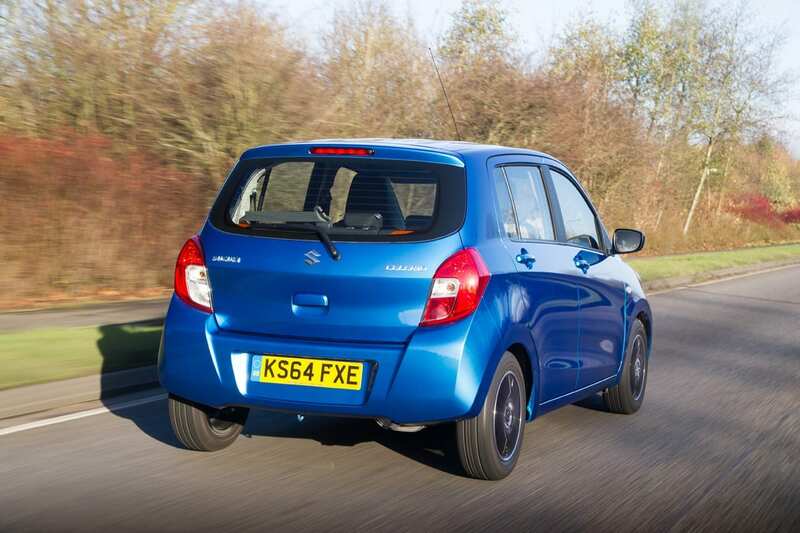 Being conscious of maintaining a low-cost entry point to its range, Suzuki Cars has taken the unprecedented step of introducing a surprisingly sophisticated new model and Iain Robertson is immensely impressed. 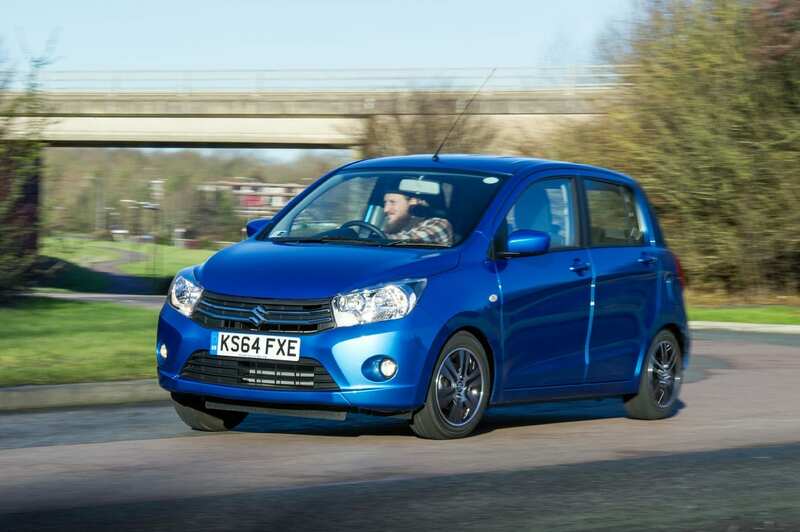 If price were the only precursor in the increasingly popular ‘tiddler’ segment of the new car scene, at £7,999 for its SZ3 specified Celerio model, Suzuki would be grappling with runaway sales prospects. However, for £2,000 less, the spectre of a new and slightly larger Dacia is certainly on the short-list and it hovers on the horizon awaiting the unwary. However, I would not spend a penny on that pseudo-Gallic, Romanian-built hunchback, because, in good value terms, the Suzuki eats it! 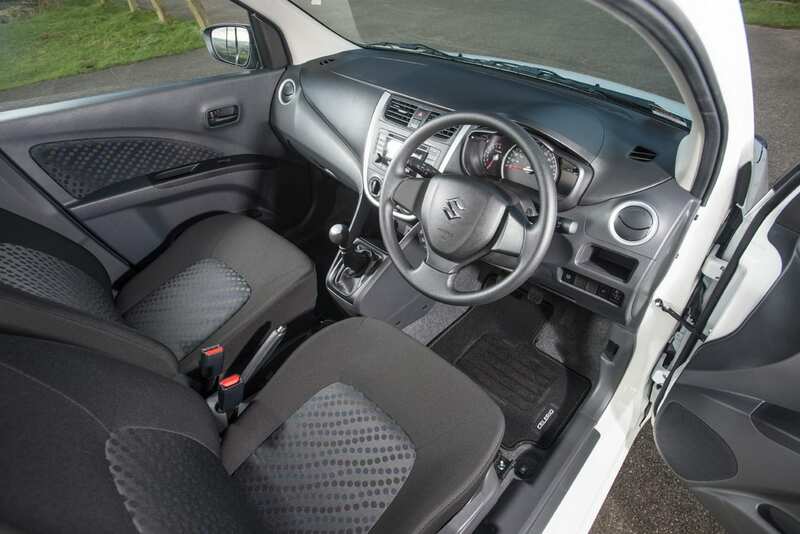 It is fortunate that the Celerio customer would be acquiring a new car that actually offers more interior space than the Dacia, but the Suzuki is also of significantly higher build quality and is guaranteed to be markedly more dependable. These are both characteristics that are worth much more to the wise urban motorist than a ‘couldn’t care less’ advertising remit and French-type electrics. 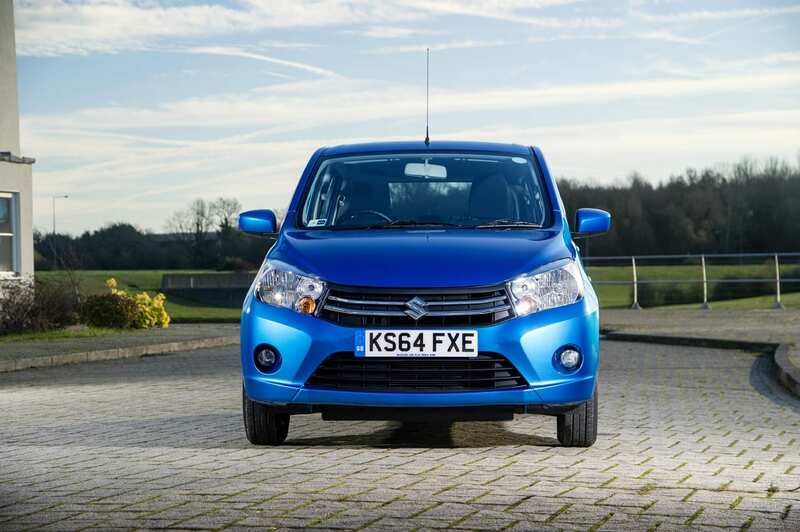 Mind you, the Celerio has a double act to replace in Suzuki’s UK line-up. While dimensionally smaller (only just) than them, the Splash and Alto models are no longer being imported. While this might leave Suzuki slightly exposed at the budget end of the market, the Celerio is actually so good that I cannot perceive its introduction as anything less than apposite. Yes. It is that good. Within its handy 3.6m length is one of the best appointed cabins in the class. Of course, I should highlight that such brevity equates to tremendous ease of parking and, unusually for a modern car, you can place it very accurately, when carrying out either parallel, or kerbside, parking manoeuvres. This little ‘Tardis’ of a car (try explaining that to a Japanese Chief Engineer, who has no concept of ‘Doctor Who’ and you might appreciate the fun I experienced explaining it) is so lacking in fussiness and daft styling nuances that it falls into the ultimate classification of ‘automotive white goods’. Believe me, live with a Celerio briefly and you simply will not wish to hand it back. I shall return to the essential specification in a few moments, as I wish firstly to inform you about its outstanding verve. Powered by a 1.0-litre ‘triple’, pretty much a standard offering in the tiddlers’ sector these days, the unit develops a moderate 65bhp. Put into perspective, the original ‘Issigonis’ Mini, powered by a 998cc ‘four-pot’, kicked out a positively joyless 32bhp, yet it was popularity personified for decades. While you scarcely expect it to ‘set the heather alight’, I can tell you that it is eager, willing and recorded no less than 108mph (indicated) in my hands (in fourth, not fifth gear), so it cannot be said to be lacking in any way. Incidentally, the manual gearshift is the slickest of the slick, requiring little more than digital pressure to snick-snack around the gate. The Celerio is an utter hoot to drive and it does what all small cars should do but sadly do not, by putting a broad smile on the driver’s face. Exceptionally well-geared, it can scurry from 0-60mph in around 13.0 seconds (up with the class average) but, with its CO2 emissions rated at 99g/km, it offers a zero-rating for vehicle excise duty. Its 65.7mpg Official figure, unusually, is a dead cert for most drivers to replicate. However, the mention of gearing also introduces an alternative Automated Gear Shift (AGS) option. This ingenious little device ensures that the thumpy ratio shifts of typical, single-clutch, automated ’boxes are relegated to the ‘bad memories’ bin. Suzuki achieves what was thought of being an ‘impossible task’ by introducing a ‘creep’ facility, which aids smooth progress in traffic jams and while carrying out low-speed manoeuvres. However, it is not strictly feasible to smooth out progress completely, without some appropriate driver input, as the transmission does not feature a ‘fluid flywheel’, as a true automatic would. Yet, full throttle upshifts are significantly more refined than I expected them to be and downshifts are imperceptible. Selecting ‘manual mode’ and modulating the applications of throttle, this is by far the best, single-clutch, automated transmission that I have ever driven, mainly because it is far less demanding of the driver and that, I can assure you, will win it tremendous appreciation for Suzuki in the UK. In fact, in Japan, the Thai-built tiddler sells almost 50% of its models with the AGS system. With typical Tokyo traffic snarl-ups, I can understand the benefits and there is no loss of performance in any respect. 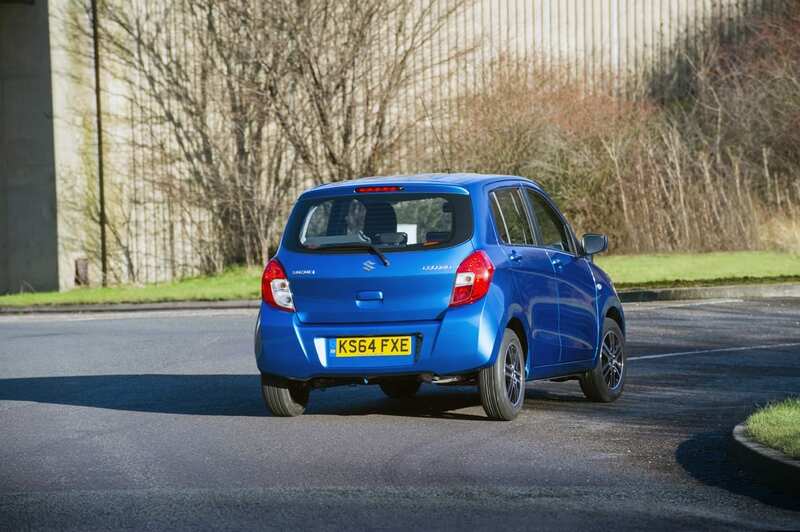 The only version of the new Celerio that I drove was in SZ4 trim, which retails for £8,999. What do you get for the extra ‘grand’? Actually, quite a lot. Apart from featuring no less than six airbags, ESP (stability control) is standard, a Tyre Pressure Monitoring System is fitted and Hill-Hold Control, ensures no rearward slip on inclines, which eases hill-starts. As Mr Suzuki (no relation; Suzuki is a surname like ‘Smith’ in Japan) explained to me, extensive prototype development driving carried out in the UK, led to additional body strengthening in the final product. As a result, the frame is exceptionally rigid, which has the added benefit of allowing the suspension to work properly. In fact, the ride and handling is one of the most impressive features of the new Celerio. I can still remember tall and skinny Oriental city cars that made their occupants feel as though every corner would be an adventure. Jostled uncomfortably in a cabin that offered no respite, driving a ‘kei-class’ car used to be a genuine trial and car sickness was the customary result. There are no such issues with the Celerio. By raising the roll centre of the car, fitting 14-inch diameter alloy road wheels and 165/65×14 high pressure tyres (38psi), body roll is minimised, passengers do not suffer from uncomfortable ‘head sway’, a trait familiar to SUV owners, and both suspension squat and dive are also maintained within controllable parameters. The result is outstanding balance and, despite the relative firmness of the spring and damper rates, the ride quality is exemplary and smooth. Okay. I promised another deeper look at the interior of the car. For a start, it is of five-door construction. Access and egress are both excellent, even for the tallest of occupants, and there is plenty of cabin space for four large adults, with a fifth at a squeeze. However, belting in three teenagers into the rear bench would not present any issues. By the way, the boot offers a class-leading 254-litres of luggage room. Although hard plastics cover most touch surfaces inside the car, their build quality is first-class, in fact every bit as good as the VW Up model, which has been regarded as one of the best of the small car brigade. A comprehensive instrument panel that includes a rev-counter, the speedo (of course), a ‘shift light’ and an on-board computer read-out, is clear and easy to read. 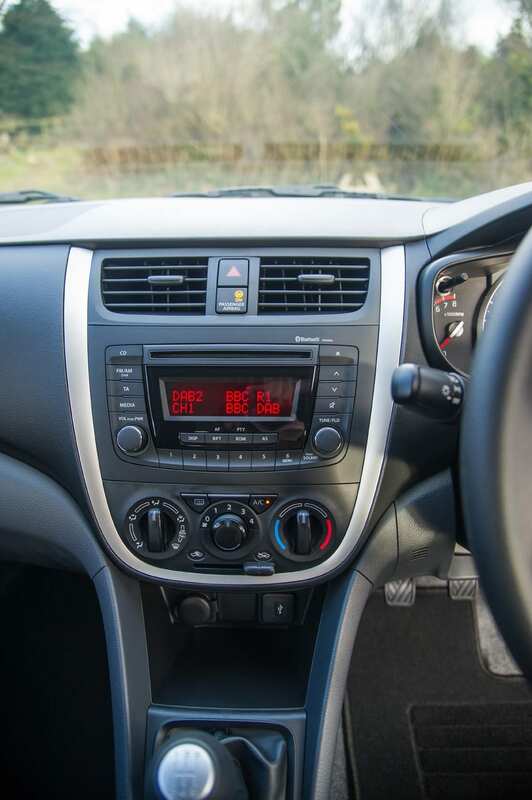 The HVAC controls, which include air conditioning, are within easy reach on the centre console, with the DAB radio/CD stereo system (with USB and Bluetooth connectivity) located just above. There is a useful storage slot between the gearlever and the centre console, while door pockets and a deep glove-box cater for most in-car eventualities. The front seats are particularly grown-up, pleasantly cloth-trimmed and both supportive and very comfortable. Driving long distances should pose few issues in a Celerio. Front fog lamps are standard, as are electric windows fore and aft and central locking. Future developments will include the aforementioned AGS transmission (£800) and the introduction of the Dual-Jet 84g/km (CO2) and 78.4mpg version of the engine around April time. Conclusion: Through being exceptionally well-equipped, invitingly well-packaged and surprisingly and competently wieldy, the new Suzuki Celerio is whisked to the top of the sub-compact/city car tree. The bonuses occur in its ride and handling compromise, which is not the unsettling compromise of many rival products. 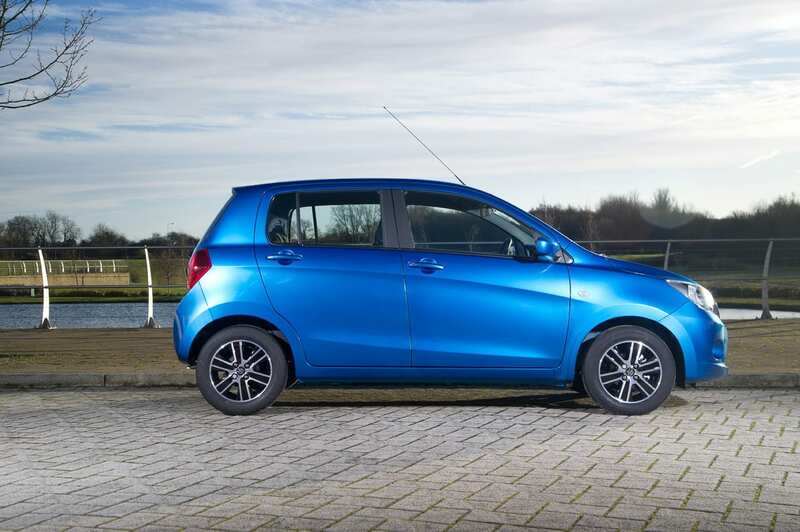 Suzuki offers tremendous value for money with its new Celerio and I simply love its willing nature and outright, cost-efficient charm.